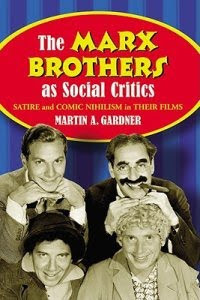 Fourth Row Center: Film Writings by Jason Bailey: Bookshelf: "The Marx Brothers as Social Critics"
Martin A. Gardner’s The Marx Brothers as Social Critics: Satire and Comic Nihilism in Their Films was expanded from the author’s PhD thesis, and reads like it. The notion of how their films sent up the morals and mores of their time is a ripe one for analysis, to be sure. The trouble is, that ground has been thoroughly covered by Simon Louvish’s indispensible Monkey Business and Joe Adamson’s brilliant (if unfortunately hard to locate) Groucho, Harpo, Chico, and Sometimes Zeppo, and those books were enjoyable to read; funny, insightful, entertaining. In contrast, The Marx Brothers as Social Critics is a dry slog, its arid academic approach apparent from the title forward. Though there is some valuable information here (particularly the background on some of the team’s finest writers, who frequently don’t get their due), there’s little new for anyone even casually familiar with the Marx filmography; in fact, there are frequent, embarrassing errors. In an early chapter on the Marx influence in comedy and pop culture, Gardner writes, “Woody Allen created an entire film referring to the Brothers and entitled A New Kind of Love, from one of the songs performed by Zeppo in the film Monkey Business.” This sentence will leave both Allen and Marx fans scratching their heads; digging deeper into his description of the film in question, the reader finally realizes that he’s talking about Everyone Says I Love You, the title taken from a song each of the four brothers performed individually in Horse Feathers. How many seconds on imdb would it have taken to check that? (And not split hairs, but Zeppo also wasn’t the only one to perform “A New Kind of Love” in Monkey Business; all four brothers took a stab at it, during the famous “passport” sequence). Later, Gardner names Buster Keaton as one of the uncredited writers involved in A Night at the Opera; Keaton’s time as an MGM gag man didn’t begin until two years after that film, in 1937, and every Marx and Keaton bio notes that he first went to work for the Marxes in 1939’s At the Circus. The bulk of the book, however, consists of scene-by-scene (often line-by-line) breakdowns of the Marx Brothers movies, and Gardner’s painstaking commentary and contextualization basically boils down to having someone sitting next to you, explaining every joke. He schlepps us through Groucho’s first scene in The Cocoanuts, which includes the line “Remember, there’s nothing like liberty, except Collier’s and The Saturday Evening Post.” Gardner then helpfully interjects, “Liberty, Collier’s, and The Saturday Evening Post were three popular magazines in America at that time.” You get the idea. The Marx Brothers as Social Critics feels much longer than its 210 pages, and its price tag ($35 for a trade paperback) doesn’t match up with the quality of what’s inside. "The Marx Brothers as Social Critics" is now available at bookstores and online. Good review. FWIW, I reviewed a MacFarland book a few years ago and also found many embarassing errors which, as you say, could have been checked on imdb.